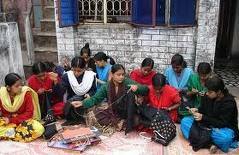 In this picture these ladies are using their new skills to weave bags and baskets they then sell to support themselves and their families. They have been given a new trade. A new and healthy way of living life. This is the beauty of restoration. Women all over the world have found new life in Christ. Jesus has saved them from the horrors of a brothel and He is their everything! Imagine what God could do through you giving to these children and women. He has a plan for their life…what if you are a part of it? Pray, ask and listen to how God might be calling you to help.